I have often marveled at the strange comfort persons offer you when they say, “Ah, there are others who suffer more than you do.” Am I a demon, then? Am I expected to rejoice at the news of other peo- ple’s miseries? Far otherwise! I am pained to think there should be sharper smarts than mine, and my sympathy increases my own woe! I can conceive of a fiend in torment finding solace in the belief that others are tortured with a yet fiercer flame, but surely such diabolical comfort should not be offered to Christians! It shows our deep depravity of heart, that we can extract comfort out of the miseries of oth- ers, and yet I am afraid we rightly judge human nature when we offer it water from that putrid well! There is, however, a form of comfort akin to it, but of far more legitimate origin—a consolation honora- ble and Divine. There was ONE upon whom God’s Wrath pressed very sorely. There was ONE who was, in truth, afflicted with all God’s waves! That One is our Brother, a Man like ourselves, the dearest lover of our souls, and because He has known and suffered all this, He can sympathize with us this morning, in whatever tribulation may beat upon us! His Passion is all over now, but not His compassion! He has borne the Indignation of God, and turned it all away from us; the waves have lost their fury and spent their force on Him, and now He sits above the floods, yes, He sits King forever and ever! As we think of Him, the Crucified, our souls may not only derive consolation from His sympathy and powerful succor, but we may learn to look upon our trials with a calmer eye, and judge them more according to the true standard. In the Presence of Christ’s Cross, our own crosses are less colossal; our thorns in the flesh are as nothing when laid side by side with the nails and spear. But, secondly, let us remark that saints do well to trace all their trials to their God. Heman [the Ezrahite] did so in the Text: “Your wrath lies hard upon me; You have afflicted me with all Your waves.” He traces all his adversity to the Lord his God! It is God’s Wrath. 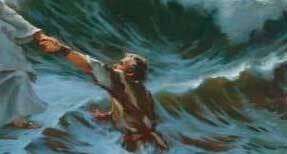 They are God’s waves that afflict him, and God makes them afflict him! Child of God, never forget this—all that you are suffering of any sort, or kind, comes to you from the Divine Hand! “Truly,” you say, “my affliction arises from wicked men”; yet remember that there is a Predestination which, without soiling the fingers of the Infinitely Holy, nevertheless rules the motions of evil men as well as of holy angels! It were a dreary thing for us if there were no appoint- ments of God’s Providence which concerned the ungodly; then the great mass of mankind would be en- tirely left to chance, and the godly might be crushed by them without hope. The Lord, without interfer- ing with the freedom of their wills, rules and overrules, so that the ungodly are as a rod in His hand with which He wisely scourges His children. Perhaps you will say that your trials have arisen not from the sins of others, but from your own sins; even then I would have you penitently trace them to God. What, though the trouble springs out of the sin, yet it is God that has pointed the sorrow to follow the trans- gression—to act as a remedial agency for your spirit. Look not at the second cause, or, looking at it with deep regret, turn your eyes chiefly to your heavenly Father, and “Hear you the rod and who has appoint- ed it.” The Lord sends upon us the evil as well as the good of this mortal life! His is the sun that cheers, and the frost that chills! His is the deep calm, and His the fierce tornado! To dwell on second causes is frequently frivolous, a sort of solemn trifling. Men say of each affliction, “It might have been prevented if such-and-such had occurred; perhaps if another physician had been called in the dear child’s life had still been spared; possibly if I had moved in such a direction in business, I might not have been a loser.” Who is to judge of what might have been? In endless conjectures we are lost, and cruel to ourselves, we gather material for unnecessary griefs. Matters happened not so—then why conjecture what would have been had things been different? It is folly! You did your best, and it did not answer—why rebel? To fix the eyes upon the second cause will irritate the mind; we grow indignant with the more immediate agent of our grief, and so fail to submit ourselves to God. If you strike a dog, he will snap at the staff which hurts him, as if it were to blame! How doggish we sometimes are, when God is smiting us, we are snarl- ing at His rod! Brothers and Sisters, forgive the man who injured you; his was the sin, forgive it, as you hope to be forgiven; but yours is the chastisement, and it comes from God; therefore endure it and ask for Grace to profit you by it! The more we get away from intermediate agents, the better, for when we reach to God, Grace will make submission easy. When we know “It is the Lord,” we readily cry, “Let Him do what seems good to Him.” As long as I trace my pain to accident, my bereavement to mistake, my loss to another’s wrong, my discomfort to an enemy, and so on, I am of the earth, earthy—and shall break my teeth with gravel! But when I rise to my God, and see His hand at work, I grow calm; I have not a word of repining, “I open not my mouth because You did it.”David preferred to fall into the hands of God—and every Believer knows that he feels safest and happiest when he recognizes that he is in the Divine Hands. Quibbling with man is poor work, but pleading with God brings help and comfort. WATERBROOK MULTNOMAH DIVIDING AGAINST ITSELF?